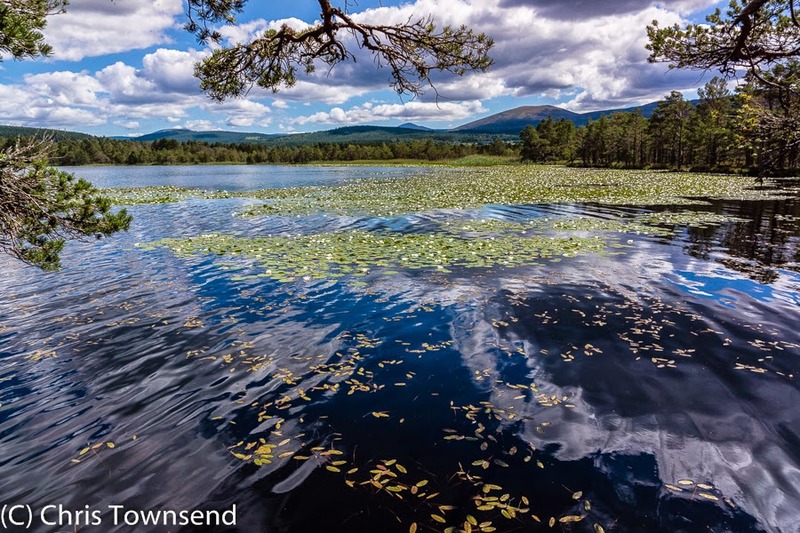 Out on the loch beyond the water lilies a goldeneye duck and duckling floated in the sunshine below the cloud-dappled blue sky. A peaceful scene. The only sound the gentle ripple of water on the shore. Abruptly a duck, a mallard, skittered out of the reeds and across the water, wings flapping, legs thrashing wildly, quacking loudly. Just behind it a fluffy duckling paddled frantically, trying to keep up. Something dark surged in the water behind the duckling. A rounded head emerged briefly then a curving body slicing through the water. An otter. There was flurry in the water. Otter and duckling vanished. The duck continued alone. Further out the goldeneyes drifted serenely. Within seconds the scene was calm again, the brief life-and-death drama over. 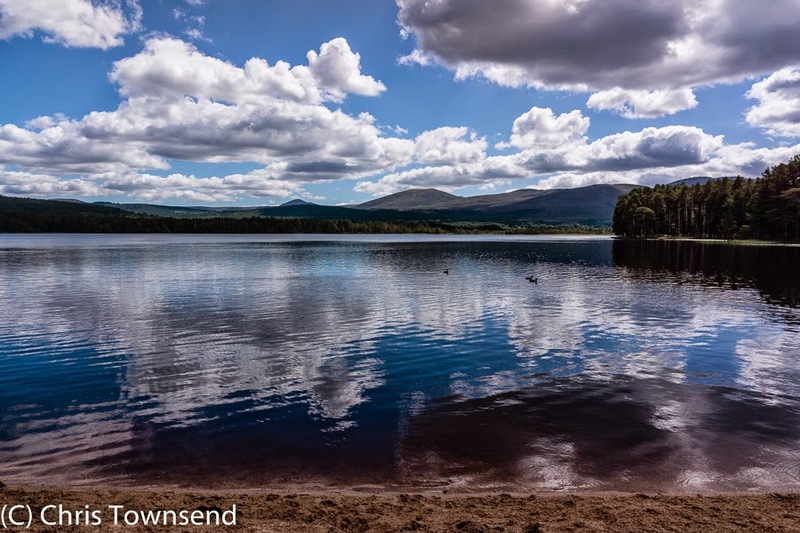 This was the one moment of excitement on an otherwise tranquil wander beside beautiful Loch Garten and through the pinewoods of Abernethy Forest on a lovely sunny day. Everything glowed with warmth and life. White water lilies spread round the edges of the loch, more than I’ve ever seen here before. The first blaeberries were appearing in the woods. Nature at its most relaxed and welcoming. Then there was that sudden flash of violence, the sudden ending of a duckling’s brief existence. A reminder of the reality of how much of nature works. 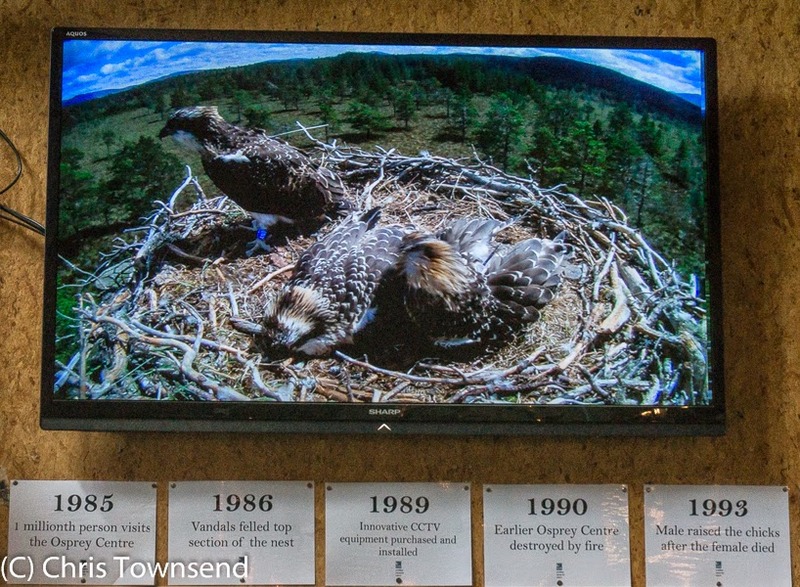 Live video of the osprey nest in the visitor centre. Earlier we had visited the RSPB’s Loch Garten Osprey Centre not far from the loch, our first visit of the year and rather later than usual. The three young ospreys were almost ready to fly, standing on the edge of the nest and flapping their wings. Their mother perched on a nearby tree, watching. Using the powerful centre telescopes we were able to watch them and marvel at their grace and power. There are also live videos in the centre that show them closely. Like the otter these are hunters as the piercing eyes and hooked bills showed. Soon they will leave the nest and then Scotland, heading south to West Africa for the winter. Seeing the ospreys and reflecting again on their return to the Highlands and the work that went into protecting them is always inspiring and gives hope for the future of wildness and nature.